The Venezuelan leader reported that the trial period will be extended by 15 days in eight border states of the country. Sept 3 (teleSUR) The president of Venezuela, Nicolás Maduro, announced that as of this Tuesday, the trial period begins for the sale of gasoline in eight states of the country through the Carnet de la Patria (homeland card) system. From the Miraflores Palace, the Venezuelan president indicated that the electronic payment system for gasoline will begin in border states such as Zulia, Sucre, Táchira, Bolívar, among others. Likewise, he explained that the electronic service will be distributed in 315 gas stations, which will be extended for 15 days so that they become familiar with the new system and thus avoid the contraband of gasoline. The Venezuelan head of State noted that some 18,395,782 citizens have registered in the Carnet de la Patria system. 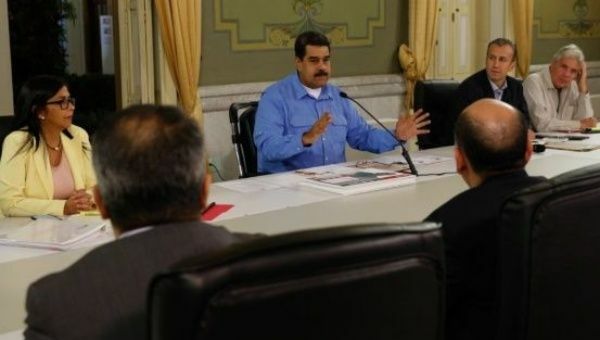 Maduro explained that “Today we are in a position of new advantage in the face of destabilizing factors, today we are making progress in stabilizing the exchange rate, in stabilizing the definitive recovery of wages, pensions , the fair prices agreed, today we are advancing on several fronts, we have new advantages, but we still need a lot to achieve a definitive victory for happiness, stability, economic equilibrium, growth and prosperity of our country, ” he said. He emphasized that there are great surprises about Petro in the coming days. “The program of economic recovery is made in Venezuela, with the advice and support of many people around the world, but it is not a program like in Argentina imposed by the International Monetary Fund (IMF), a shameful program that Macri has imposed to the Argentine people.